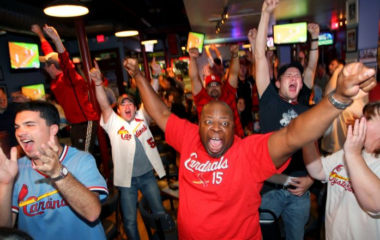 The Post Sports Bar & Grill opened its flagship location in Maplewood, MO in 2009 and is recognized as The World’s First Fantasy Sports Bar. This is a sports bar you can finally call home. We offer more than great food, drinks and a strong wi-fi connection. We offer more than an experience. We offer a lifestyle. When Posting up, you receive the perfect blend of a relaxing environment and adrenaline filled atmosphere. Whether you’re looking to root on your favorite sports team, get a good bite to eat with your kids, work on that project deadline from somewhere other than the office, indulge in a few cocktails after work, or take part in a Saturday Post Session… we’ll keep you Posted. Our specialties include mouth watering cheesesteaks, baked wings, Post-its, and homemade pizzas. With a full lunch, dinner, carry-out, boxed lunch, and catering menu, you can satisfy your crave at any time. As a true sports bar our TV’s are strategically placed so you don’t miss any of the action. And as a teaser, 100% of our seating is double padded for your sitting pleasure. So…. Sit, Relax, Enjoy… Stay Posted! Creating community through sports and cheesesteaks one Post session at a time. Setting the gold standard in fantasy sports entertainment. Building a sense of camaraderie. Educating the world on the Posting lifestyle.